In Movienizer you can manage information about your movies and about persons from the movies: actors, directors, screenplay writers, composers. To download information about some person, click the person's name on a movie page and hit the "Download" button. Alternatively, the "Add person" button can be used. When you download information about a movie, awards received by the movie can also be downloaded (according to your download settings). But if you give it another thought, a movie award is always received by some person - an actor (actress) or a crew member. 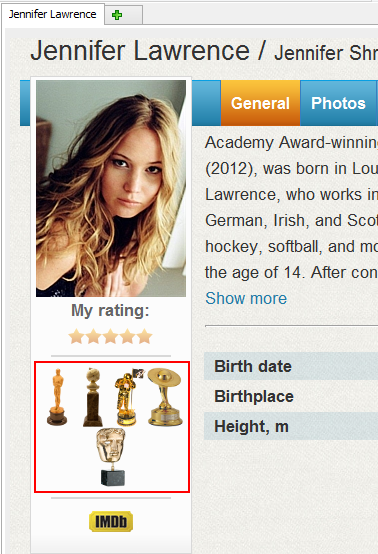 That's why Movienizer can list awards for persons, too. After this, download information about some person. As usual, you can edit the downloaded information or even enter everything manually. If the option for downloading awards was disabled, you will need to re-download information for previously added persons in order to get their awards. Just like with all pieces of information, downloading awards for persons depends on the selected information source and its settings. Which user interface program do you use ?